November is World Animal Hero Kids Month - Will You Celebrate? November is not only the month I get to enjoy the very best vegan Thanksgiving meal of mashed potatoes, stuffing, roast veggies, sage celebration roast and gravy made by the wife, it is also the month where Animal Hero Kids and teens are celebrated around the world. The good news is you don’t have to be a kid to celebrate World Animal Hero Kids month, you can still act to help empower kids and teens to be kind. This November animalherokids.org asking people to help achieve the goal of gifting a copy of the heartwarming, awardwinning, youth empowering book full of stories of youth rescuing all species of animals in need book to each school library. The book is a culmination of my 37 years of aiding animals and empowering youth; it features stories of animal rescues by youth. After each complimentary, interactive school presentation a copy of the book is gifted to the schools’ library to continue as resource for teachers and students. 1. 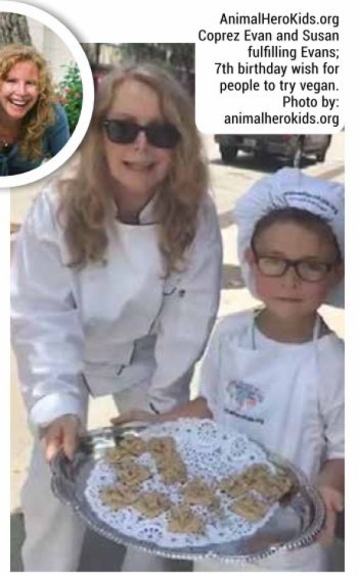 Support the “Animal Hero Kids Voices for the Voiceless” book in every school library goal by sponsoring a book being gifted to your local school, alma mater or child’s or grandchild’s school by going to animalherokids.org. 3. Ask your local library to carry the youth empowering book. 4. If you are a teacher contact education@animalherokids.org to set up a complimentary, interactive Animal Hero Kids presentation geared to your grade level needs. 5. If you are a parent (or grandparent) and your child or teen (or grandkids) would like to learn how to be an animal hero kid or teen go to animalherokids.org to get involved. In honor of November being World Animal Hero Kids month I am going to highlight one of the AnimalHeroKids.orgs’ co-presidents, there are currently six around the United States. A Florida co-prez is seven year old Free style vegan rapper Evan. Evan is a spokesperson for Animal Hero Kids at Earth Day events, Veg Fests, conferences, everywhere he goes he uses his talent of rapping to speak up for all species of animals. His seventh birthday wish was to offer free, vegan fare to passersby in his downtown Florida town. Tofurky donated product coupons and I mixed up a batch of Tofurky chickenless salad with grape seed extract veganaise and organic fresh dill and green onions on rosemary flavored crackers. We put our chef’s hats on and polished up the sliver platters and Evan was granted his birthday wish as he encouraged people to try vegan. He also had a birthday wish for a cordless microphone, which came true. Thanks to a local news outfit covering the event, thousands heard about how to be heroes for animals three times a day.